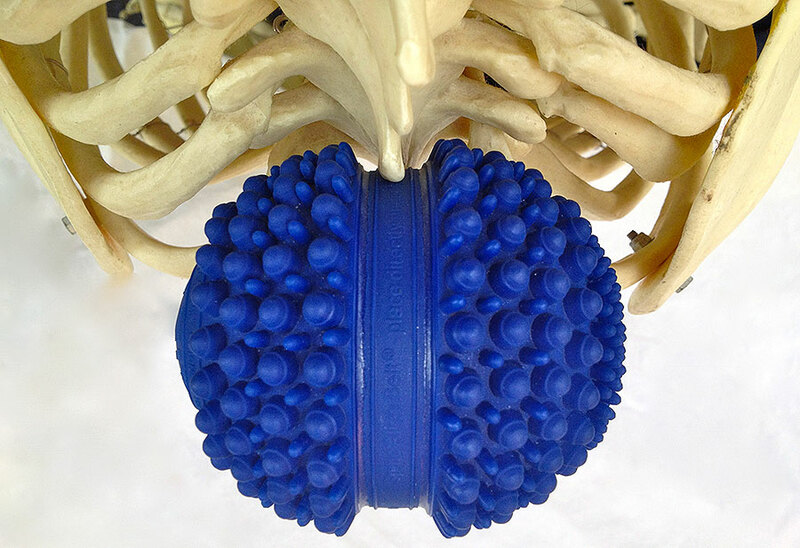 I have long sung the praises of the acuball, a blue ball designed to fit along the curvature of one’s spine for the purposes of chiropractic self-treatment. I believe I was among the product’s first generation of users, and blogged about it first in 2009, when I was suffering badly from a herniated disc. I had learned about it directly from its inventor, Dr Michael Cohen, whom I met at a yoga convention, of all things. I bought one from him on the spot. As you know, I travel a LOT, several times per month, often on very long flights. The acuball has proved to be a valued companion on those long journeys, providing much needed spinal support in airplane seats that are built to encourage unhealthy slouching. Often when I travel, airport security gives the acuball an extra close examination, since it is filled with water and completely sealed. I always take it out of my bag and present it plainly, offering to explain its purpose at every check-in. Finally, the ball was confiscated by the Chinese airport authorities in Beijing, at the most inopportune moment, as I was midway through a trip around the world. I was incensed, but figured it was a symptom of overly controlling Chinese authorities. My replacement ball was later confiscated at an American airport, though I don’t remember which one. I wrote to the company then to suggest that they might want to look into somehow getting the product recognized by the government transportation authorities. I got no response. Last year, my next acuball was confiscated by Belgian authorities in Brussels, as I was en route to Rwanda. At that point, I swore off buying replacements. But I missed the bloody thing. So someone near and dear to me purchased yet another acuball for me. At this point, I’d like to point out two things. First, the acuball by itself costs $30 without tax and shipping. As part of its larger kit, it’s $60 without tax and shipping. So this is not a casual expense. The other thing is that, as mentioned, I travel a lot, which means that the incidence of confiscation as a proportion of total times through security is vanishingly small… which is why it is still worth trying to get the thing onto the plane, because the risk of confiscation is low and the benefits (for me) enormous. Last week, the officials at the Ottawa airport confiscated my latest acuball. I demanded to speak to the manager and told him that I fly weekly out of this airport, and had never before had a problem with the device. Usually, the security personnel categorize it as either a prosthetic or a stress ball, and I don’t try to correct them. So I wrote to acuball customer service again. I sent them what I consider to be a polite email, once again extolling the virtues of their product, but lamenting its fourth confiscation, and stating that I probably won’t be able to get a new one until the tendency for airports to confiscate it is addressed. How would it be addressed? I don’t know. But as a long time vocal supporter of the product, and one who really wants to be able to use it for all my travel needs, I felt it was important to keep the company informed of some of the factors affecting this customer’s enjoyment of the product. I actually didn’t expect a response. What I hoped to receive, at best, was an acknowledgement that sealed fluid nature of the ball’s design was problematic from a security standpoint. There’s not a whole lot they can do about it, short of altering the design, except for maybe attempting to open a larger dialogue with national and international airport security administration for the purposes of expanding awareness of products like this, perhaps exploring a medical licencing approach that would give credence to the acuball’s therapeutic nature at the security gate. That’s right. The customer who has been singing the praises of your product for years expresses a concern with its distribution, use, and acceptability and your response is to blame him. Good job. So there you have it. Acuball is still a very useful product, and I recommend it to you without hesitation, if you can handle the price tag and don’t want to use it on planes. But the acuball company sure has a lot to learn about customer relations.